381. What was the percentage decline in the production of fertilizers from 1997 to 1998? 382. The average production of 1996 and 1997 was exactly equal to the average production of which of the following pairs of years? 383. 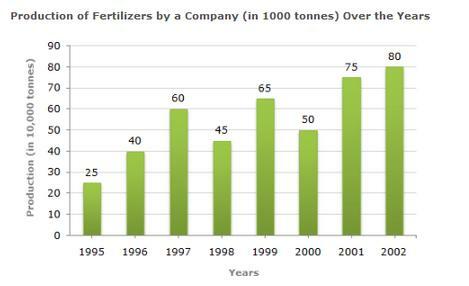 What was the percentage increase in production of fertilizers in 2002 compared to that in 1995? 384. In which year was the percentage increase in production as compared to the precious year the maximum? 385. In how many of the given years was the production of fertilizers more than the average production of the given years?